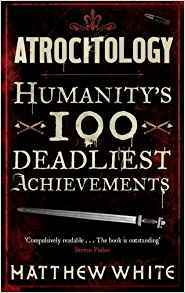 In his book Atrocitology (aka The Big Bad Book of Horrible Things in other editions) Matthew White lists the 100 bloodiest episodes of human history. Although not a professional historian his list, with accompanying information and classifications, has been welcomed by many academics. Steven Pinker referenced it in his The Better Angels of Our Nature to argue that humankind is getting less violent. Top of White’s list is World War II with 55,000,000 deaths. The 8th century An Lushan Revolt in China comes 4th with 36,000,000. Pinker took into account the relative world population in earlier times by giving mid 20th century equivalents. The weighted death tolls moved the An Lushan Revolt up to 1st place with 429,000,000 while World War II dropped to 9th place. As another example, White places the Middle East Slave Trade (7th-19th centuries) in 9th place with 19,000,000 deaths and the Atlantic Slave Trade (15th-19th centuries) in 10th place with 18,000,000. After applying Pinker’s weighting the Middle East Slave Trade moved up to 3rd place with 132,000,000 and the Atlantic Slave Trade moved up to 8th place with 83,000,000. Atrocitology is a fascinating read but there is one thing missing…the real number 1, which doesn’t appear in the top 100 at all! I know, it’s a shock. Let me try and approach the matter obliquely. Number 30 on White’s list is the Crusades with 3,000,000 deaths. Several campaigns were launched over a period of 200 years yet he classifies them as an analytically and functionally coherent group; not a sequence of distinct events but a succession of waves of new recruits fighting the same long war. That seems a reasonable view because the Crusades were started as a response to a call to war issued in 1095 by a religious leader, Pope Urban II, and they had in common the religiously motivated aim of taking control of a particular piece of real estate, the Holy Land, from their Muslim rulers. I was shocked to find so many battles fought between Muslims pushing west and then north into Europe, and Christians defending their lands (and then counter-attacking in the early stages of the Reconquista of Spain). So I asked a professor of history who confirmed that they really happened. Are the campaigns fought over 450 years a sequence of distinct events or a succession of waves of new recruits fighting the same long war? The military expansion of Islam also started as a response to a call to war by a religious leader, Mohammed (speaking for Allah), in the 620’s. The Muslim invasions also had in common the religious aim of taking control of a particular piece of real estate from their non-Muslim rulers. It just happens to be rather larger than that fought over in the Crusades, namely Dar al-Harb (the house of war), all of the world not yet brought within Dar al-Islam (the house of Islam). It is an unfamiliar comparison to most people simply because of the difference of scale in both time and space, but the principle is the same for both. Over 200 years the different waves of Crusaders took control of (and lost) Antioch, Edessa, Tripoli, Jerusalem and Acre. Over 450 years waves of Muslim armies took control of Jerusalem, Cairo, the whole of North Africa and Spain. If one campaign can be grouped together as the Crusades then I can see no reason why the other should not be grouped together as Jihad. Look at it this way. 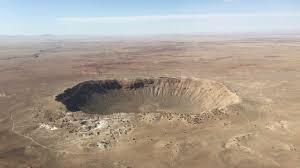 Everyone recognises Meteor Crater in Arizona as just that, a meteor crater. That is because we are looking from the outside and it is small enough (1 km across) and well enough defined to afford us a clear view of the whole thing. The citizens of Nordlingen in Germany, on the other hand, had no idea they were living inside a meteor crater until modern science showed that the 24 km wide depression in which Nordlingen sits is just such. The Nordlinger Reis crater is less obvious but it is every bit as much a crater as its more famous cousin. Likewise, to us the Crusades are clearly a long but coherent military campaign, but Jihad is less obviously so. Firstly, its spatial extent is so much greater, in fact it has no boundary since the world is round. Secondly, its temporal extent is also unclear since it is still continuing today, 1400 years after its inception. On both counts we are living within the crater of Jihad and, unable to see the rim, do not recognise it for what it is. Firstly, The Maliki manual of Islamic Law, the Risala, defines the word “jihad” as “a technical term for the Muslim fighting the unbelievers who have no treaty with the intention of elevating the word of Allah or presenting Islam”. The Risala provides a succinct explanation of Jihad in Chapter 30: On Jihad, including important features such as the different kinds of obligation; presenting the triple choice of conversion, paying the jizya, or war; rules of engagement; and the distribution of booty. One thing missing is an explanation of the Dhimma, the agreement of protection (as in protection racket) which entailed humiliating conditions for conquered non-Muslims, including the jizya tax, in return for which they were permitted to a) practise their ancestral faith and b) remain alive. Note the phrase “without limit of time and space”, making clear the scope of Jihad. It could accurately be referred to as “Eternal and Global Jihad” but let’s just stick with “Jihad” for the sake of brevity. It is the source of the famous triple choice traditionally presented to unfortunate infidels who happened to be next on the map: Convert, Submit and pay the jizya, or War. There are those who maintain that 9:29 and the other Jihad verses, conveniently highlighted in mauve here, refer only to the infidels Mohammed happened to be fighting at the time he produced the revelations. 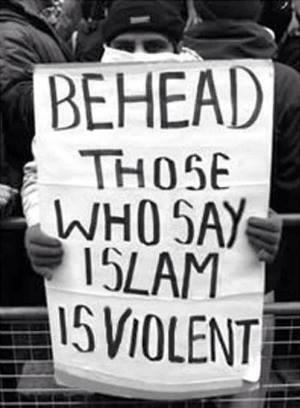 That would be a plausible claim if Mohammed had called a halt to his Jihad at the borders of Arabia before he died. But he didn’t. Mohammed’s last act was to send Jihad international by ordering an attack on Byzantine Syria. His surviving companions, who presumably understood his intentions, immediately set about subduing rebelling tribes in Arabia and then attacked their neighbours to East and West. What we can definitely say is that the Muslim warriors who took Islam to the infidel after Mohammed’s death clearly subscribed to the “universal” rather than the “contextual” view of Jihad. And remember, they did not issue ultimatums in the name of this or that empire, but always in the name of Islam. As White points out in his chapter Religious Killing, “…if the parties declare religious motives, we should at least consider the possibility that they are telling the truth”. Both the examples above are taken from Robert Spencer’s indispensable The History of Jihad. What was the extent of Jihad? Here is the video from which the pictures above were taken, showing Jihad in the West and the Middle East, not just up until the Crusades but throughout 13 centuries, starting with Mohammed’s wars to bring Arabia under Islam and ending with the collapse of the Ottoman Caliphate in 1924. And there was just as much Jihad carried out to the East, some say to much more deadly effect in India, and all the way to China. For our purposes I think we should discount the figure of 120,000,000 Africans. It comprises slaves taken plus collateral losses in transportation, and dependents left behind to starve. Slavery is definitely connected to Jihad because taking slaves as booty from Jihad raids is sanctioned in Islamic Law, but it cannot count as Jihad itself because the Middle East slave trade was not conducted in order to convert slaves but merely to profit from them. So that would give us an estimate of 150,000,000 deaths due to Jihad. It is only an estimate, made up from estimates. The fact is that no one really knows the correct figure so suppose, for the sake of argument, we halve that number to 75,000,000. Since the total for World War II stands at 55,000,000 Jihad immediately shoots to number 1. Applying Steven Pinker’s weighting would surely also push Jihad above the 8th century An Lushan Revolt with 36,000,000 (unweighted) deaths since the first great Jihad conquests took place in the 7th and 8th centuries and the invasion of India started around 1000 AD (with less weighted increments ever since). Why does Matthew White not include a chapter on Jihad or even have an entry for it in the index? Presumably because it never occurred to him that it forms a coherent whole just as much as the Crusades do. Nor does he detect Jihad in particular atrocious episodes of history. For instance he denies the Muslim invasion of India a place in his list because it is “too long and sporadic to count as a single event”. His dismissal is arbitrary. If he understood what Jihad is he would recognise that it doesn’t matter how long and sporadic the long war is. Allah has plenty of time. Also, although he gives Aurangzeb a chapter, White does not see his wars against the Hindus and Sikhs as Jihad, even though he touches on the humiliating conditions of the Dhimma Aurangzeb imposed on Hindus, and the temples he had destroyed and replaced with mosques. Puzzlingly, White identifies the dividing line in these conflicts as being between Muslims and Hindus but does not classify Aurangzeb’s wars as religious yet in the preceding chapter about Cromwell’s invasion of Ireland he identifies the dividing line as being between the English and the Irish but does classify it as religious. White is not alone in this unseeing of the thread of Jihad which connects apparently unconnected conflicts in the Old World over 1400 years, and now around the whole world. It is a cultural pathology currently affecting the great majority of people in the West. Until a hundred years ago the West (aka Cristendom in those days) knew Islam as its implacable enemy. Mystifyingly, over the last 50 years or so, a great amnesia has fallen upon the population. Why did that happen? It is not as though Jihad has disappeared. In fact it has come roaring back after 150 years of relative quiescence under European colonialism (here is a list of 35 recent or current conflicts “fought as Jihad”). We can only speculate on the reasons, but invariably our attention is diverted away from the one thing that the endless litany of atrocities on our streets share in common. Academics tell us that Muslims are attacking us because of poverty or Western foreign policy or othering or ontological insecurity or a host of other things. A current favourite is mental illness which is routinely diagnosed in the mainstream media immediately after a devout Muslim stabs a policeman, shouting “Allahu akbar”. Even putting those disincentives aside, I do not expect that he will accept my argument regarding Jihad and rearrange his list. Nevertheless I will ask him and report back if he replies [he didn’t]. At the moment it is only dissident scholars – Robert Spencer, Bill Warner, Ibn Warraq, Andrew Bostom, Mark Durie etc – who point out the obvious. Wouldn’t it be a great step forward if mainstream scholars started to investigate 1400 years of correlation to see if there might be some causation there too? Estimates of the death toll of Jihad might be firmed up and find a respectable place in academia alongside those for the victims of the Holocaust, Mao, Stalin etc. Danusha Goska has actually proposed a museum of the victims of Jihad, along the lines of the Holocaust Museum and similar. It would not only commemorate the dead but act as a centre for academic research for the purpose of educating the general public, academics, journalists and our purblind leaders. Why hasn’t this been done already? I expect for the same reason that Matthew White hasn’t included Jihad in his list, because so very few people have joined up the dots and realised what they spell. This entry was posted in Uncategorized and tagged Atrocitology, Big bad book of horrible things, crusades, jihad, Matthew White on November 28, 2018 by ECAW's blog.